I'll still be counting steps, though, and looking for shortcuts, so tune it for tips. In short, Levelers, don't go sightseeing in Manhattan, Boston, Toronto, Chicago, Southern California, San Francisco, Seattle, Hollywood, Philadelphia, Atlanta or Houston without a CityPASS. Not only do you save money on entrance fees, you avoid a LOT if not all of the inevitable lines. I just returned from a quick trip to Manhattan - strictly as a tourist, no travel writer special shortcuts arranged, just a CityPASS in hand. I was meeting another travel writer whose wandering had not included New York as anything beyond a port of departure for overseas trips. 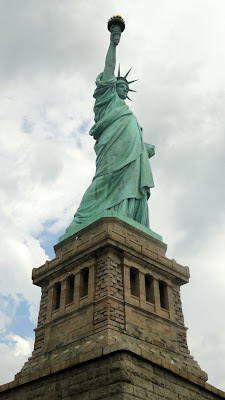 Her priorities included seeing the Empire State Building, Bloomingdale's, Statue of Liberty, Ellis Island, Central Park and a museum, time permitting. CityPASS cut 2-hour waits, ticket to top and ticket to island, by more than an hour each at the Empire State Building and for the Liberty/Ellis cruise. Had we bought anything at Bloomies we would have saved 15 percent. Had time permitted we would have avoided long ticket lines at the American Museum of Natural History, Guggenheim Museum, Museum of Modern Art and the Metropolitan Museum of Art. Price listed currently on the CityPASS website for New York is $89 adult, $64 ages 6-17, a saving of 48 percent on entrance fees alone. Convenience is worth twice that. Levelers, as you know, standing in line can be more tiring than walking and is definitely more annoying. During high season, lines are inevitable, especially at national symbols where security has added another hurdle. CityPASS helps you cut it as short as possible. This is a wholly unsolicited endorsement, in case you wondered.